I confess I was not brave enough to eat my placenta but I did manage to get it home in a food-safe container and into my freezer–two big steps up from my last birth when I rolled my eyes at the midwife for suggesting I’d want to do anything with that thing. So I was delighted when my sister-in-law agreed to write about her brave entrance into the world of health-rumors and nutritional risky business. I love her medley of honest storytelling and humorous side eye at all the threads we find ourselves googling in this day and age. Pregnancy: that time in life in which you surprise yourself again and again. The stories of strange, never-before-seen cravings and inexplicable emotions are over-told, but even still, as you watch yourself (your very normal self!) pass through each phase, it really does not fail to shock. But there are even stranger acts pregnancy invites us to than pizza rolls with peanut butter—anyone else google Evening Primrose Oil in the last trimester and stare open mouthed at the screen, reading that you can not only take it orally but also vaginally? Anyone else do it anyway? Blending raw frozen chicken livers into my smoothies: basically, it’s a multivitamin! Other things I reluctantly tried, but tried nonetheless: eating whole pints of ice cream with my husband just before bed, not exercising or moisturizing my skin a single time, getting out of bed in that way you’re not supposed to for the sake of preventing diastasis recti a hundred times every. single. night. One strange pregnant-person thing that I knew I’d do from the beginning is also the one that many people tend to be most shocked by. In my second trimester, a friend of ours was over for a Bible study dinner and made a joke about how the wildest thing one might do is eat the placenta, like Brad Pitt and Angelina Jolie! There was such an expectation of communal, fellowship-building shock and horror in the joke; it filled me with such delight to say I absolutely planned to. In a different Bible study, years before, I got to know a pregnant person for the first time in my life. She glowed and glowed and then disappeared for a while, and when she reemerged she had a beautiful baby in tow. One night, less than a month before she delivered, she told us her OB had said it takes three years on average for a mother to restore the nutrients depleted during pregnancy. I’ve never found the research to back that up, but it’s always stuck with me. Sometime later, not in a Bible study, I heard about the practice of placental preservation. My first impression was that the idea of consuming the vessel by which your nutrients are transmitted and depleted seems kind of genius. One way of categorizing the strange things I love to try is this: low risk, high reward. As of now, there are no known risks associated with consuming the placenta, when it’s properly preserved, and the list of potential benefits is impressive: Replenishing your stores of nutrients. Preventing or aiding postpartum depression. Encouraging faster healing post-birth. There are also claims about stem cell therapy, which I don’t know enough about to go into, but are extremely interesting and nothing but positive. For me, the nutrient repletion is enough. Sign me up. People do it two ways— dehydration or freezing. There are specialists who dehydrate and encapsulate it for you, so you’re truly just taking an extra capsule every morning. The stem cell benefits are only kept intact if frozen, but for all other purposes, dehydration is absolutely fine. I once ran into my midwives’ birth assistant on the sidewalk. She was carrying a drab little lunchbox with a new mom’s placenta inside to go dehydrate. Actually, you can even dehydrate it yourself in the oven! Though then you either deal with using the powder somehow (think smoothies) or encapsulating it yourself, and that’s probably not the thing you’ll want to spend your time on in those early days. I decided to freeze mine for the sake of simplicity: I didn’t have to hire anyone, and I didn’t have to bake anything. Homebirth made this infinitely easier for me, but as demonstrated by the lunchbox anecdote, it really can be done any which way as long as you keep it very clean. (By very clean I mean use a brand new zip-lock bag.) The most important thing is to develop a simple plan, to be fully executed by someone other than you. Talk to your healthcare provider about your plan, and designate a specific person to handle the passing of the placenta (from medical table to oven or freezer to your re-possession). Talk to your partner about your plan in case you forget to tell other people your plan. I totally forgot to do this—I had the general plan in mind but didn’t designate anyone or talk to my partner about specifics. So if I correctly recall, my muscles were still spasming from childbirth as I instructed my doula to chop and freeze it. She had never done it before, which I say to demonstrate how truly easy it is to do. My midwife stepped in to explain the process of washing it and wringing it out until it’s a “bubblegum pink color.” So she did that and then chopped it into pill-sized pieces and dropped them into an ice tray to freeze. After they froze, I put them into a zip-lock and back into the freezer. I swallowed 1-3 pieces every day, like a pill, until they were gone. A final placental anecdote: My husband and I spent the first few years of our marriage living in Northern Ghana where he started an agricultural trading company. We had these massive windows on all sides of our living room, and I decided to start trying to grow some herbs. I had a shelf made by a local carpenter to fit the window that got the most light and gathered some seeds and soil. 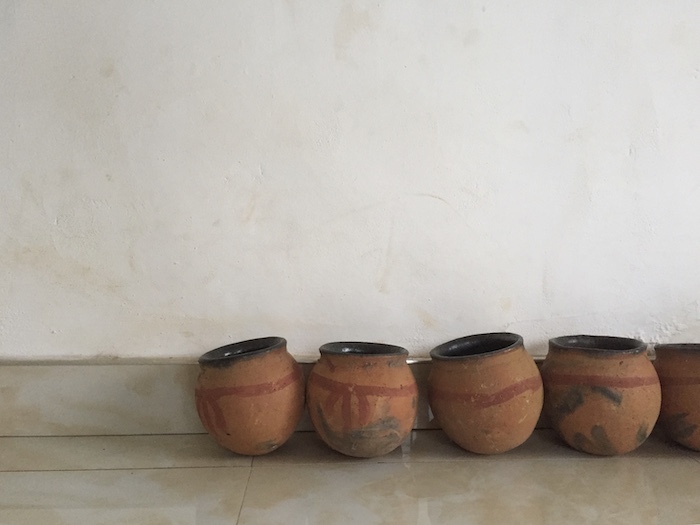 I spotted some pots along the roadside near our house that looked perfect and took a Ghanaian friend with me to buy them. The woman selling the pots didn’t speak much English, so I essentially mimed to communicate that I didn’t need the lids to the pots. She looked a little surprised. I told her I needed nine of them, and she looked absolutely shocked. The friend I’d brought with me often made jokes with strangers when we were out, so I didn’t think it odd that she was laughing hysterically along with an older woman standing nearby as I loaded the nine pots into the back of my car. As we drove away she just could not get herself together, and eventually she told me why: the pots I bought are made specifically for placentas. Traditionally, new fathers come to the birth site after the baby is delivered to gather the placenta into a single pot, with a lid, and bury it securely. This is rooted in the local religion, which is rooted in superstition, so really, I’m glad that all parties involved were able to laugh. The laughing only stopped when I told her about the plans for my own placenta—she was even more shocked than my Bible study friend who made the Brad Pitt joke. For whatever reason, my herbs never grew more than an inch. 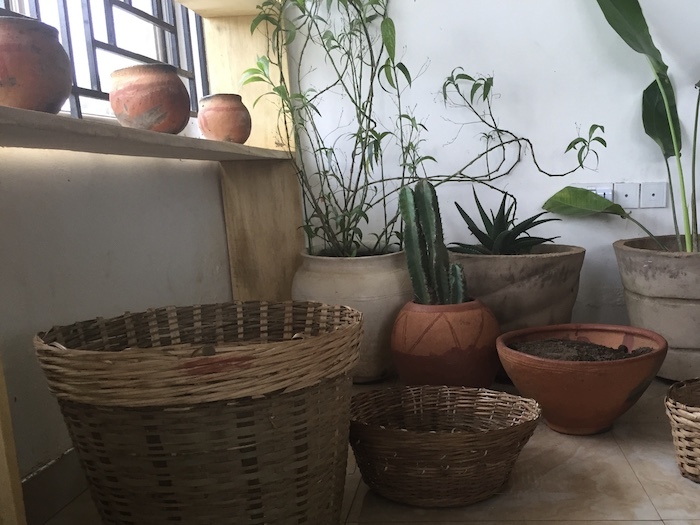 Hannah’s inadvertent collection of placenta pots and cacti pictured in the opening and closing photos. This entry was posted in Baby, Essay by Rachael. Bookmark the permalink. using a brand new zip-block bag clean! definitely planning on eating mine but I was thinking to do pills, when the time comes maybe I’ll just have it washed pink and frozen! That’s so cool to hear, thanks Dar!